Sometimes, the best way to make your point is to remain calm and guide the other person to a mutual understanding. Other times, you take their Pontiac G5 and you ram it right into a Walmart parking lot barrier over and over. 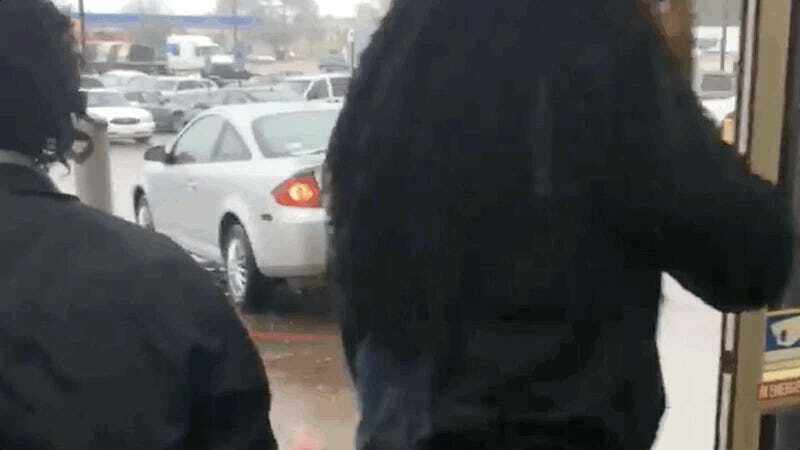 A video posted to Facebook by Aaron Mason yesterday showing a man repeatedly crashing a G5 into a Jackson, Mississippi Walmart as another man tries to open the car door to stop him has eclipsed five million views. A Jackson Police Department spokesman later provided more clues as to why somebody would repeatedly ram a car into a solid concrete barrier. It turns out the two people involved had “some type of agreement” concerning the car, and then “started to disagree about it,” according to the spokesman via The Clarion Ledger. [Police Spokesman Sgt. Roderick Holmes] said the original owner of the car wanted it back, so [Sedric Gardner] allegedly decided he would give it back when he was done altering the appearance of it. “The person in possession of the car didn’t see eye to eye with them, so they made the decision that if they were going to get the car back, they’d get it back damaged,” he said. I would say that’s about as public and messy as a civil situation can get without it becoming a crime in its own right. Explain to me how tickets are written for going five over on a highway, but this guy gets away on claims of it being a civil matter? You can’t, because it doesn’t make sense. The moral of the story, though, is that nobody probably cared that much about the Pontiac in the first place. Correction: This post originally said the car in the video was a Chevy Cobalt... yikes.